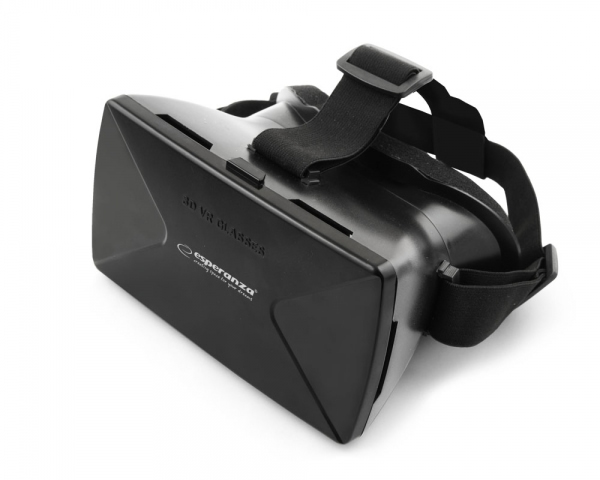 These glasses let you watch 3D films or play games in the virtual reality. Just download VR-marked games and films from the app store (APP Store or Google Play Store) or Google Cardboard onto your smartphone. Then the glasses will take you quickly into the virtual world of 360°, 3D films and VR games. In the casing you can fasten your smartphone with a screen size from 3.5 "to 6" running Android or iOS. Thanks to the application of aspherical lenses which do not distort vision, we get the feeling of its uttermost naturalness and depth, and their two-way regulation allows for individual adjustment of the device to the size of your smartphone and the distance of your eyes. The protective overlay made of soft foam not only ensures comfort of use but also enables a good fit of the glasses to your face and use them without having to take off the spectacles. Robust belts made of elastic rubber safely keep the glasses on your head. The sliding lid allows to use the telephone camera (required in case of "Augmented Reality" games). The glasses have ventilation holes and slits on their sides to connect headphones and charging cable. ATTENTION! In order to make the most of VR games it is recommended to use smartphones equipped with a gyroscope.